Car-tech fans are going to see more HUDs in the future, and we're not talking Paul Newman movies or federal agencies. HUD is short for heads-up or head-up display, a device that projects information onto the windshield of a car--the better to keep informed while also keeping one's eyes on the road. A smattering of mostly high-end cars feature integrated HUD, but IHS Automotive predicts that its adoption will increase from 2 percent of automobiles in 2012 to 9 percent by 2020. Third-party options are less common. Pioneer just announced an HUD that's currently available just in Japan, but it costs $3400. Garmin announced Monday its own third-party version. Called--surprise--HUD, it has a much more digestible list price of $130. 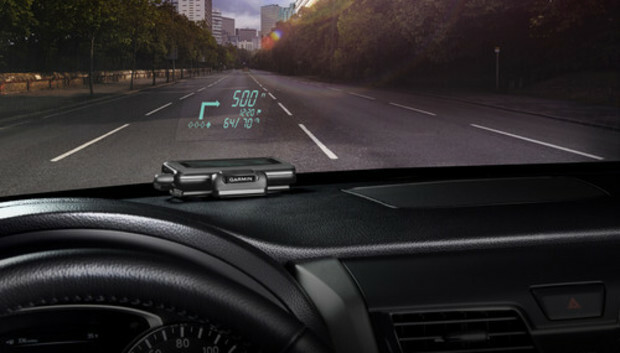 Garmin's HUD is a display device that obtains data through your Bluetooth-connected smartphone (with data plan, of course). It can project navigation and traffic data onto its own reflector lens, or onto a transparent film that you stick to your windshield. The package includes both choices. According to Garmin, the display can adjust its brightness automatically to remain visible in varying light conditions--an issue with some HUDs. The connected phone needs to be running Garmin's StreetPilot app for iPhone or its Navigon app for Android, iPhone, and Windows Phone 8. The apps cost extra, starting at $30 for a regional version of Navigon. Driver distraction is a fact of life these days, as cars are increasingly seen as yet another mobile device needing access to real-time information. HUDs are theoretically a less distracting option than integrated or third-party displays located in the center dashboard area, though they're still taking at least a little attention away from the immediate task of driving. Garmin's HUD offers an inexpensive way to upgrade an older car to this new technology. As with any in-car display, use it carefully.